Yes, it’s April and I’m late to the Meatless March party. But truth is, I’ve been going meatless on the regular for several months now. No, I’m not becoming vegetarian or vegan, but I do eat that way pretty often now. Grain bowls are a great meatless, make-ahead dinner and they last for several days in the fridge. Ones like this are meant to be served cold, so no re-heating necessary - just take it out and eat it! Don’t be intimidated by the long grocery list. A lot of the ingredients are repeated and everything can be made ahead and refrigerated for several days. Set 2 large saucepans on the stove. Add the quinoa to one and barley to the other and cook with water according to the package directions. When the quinoa is done, fluff with a fork and add the cilantro, olive oil, cumin, lime zest and juice, pepper flake, and salt to the cooked quinoa and stir together until combined. When the barley is done, add the pesto, lemon juice, and salt to the saucepan and stir together until combined. Refrigerate until ready to use. While the grains are cooking, cook the cauliflower rice. Heat olive oil in a sauté pan over medium low heat and add the shallot, garlic, and oregano. Cook for one minute or until fragrant then add the cauliflower and spinach with 1/2 teaspoon of salt and 1/4 teaspoon of pepper. Toss together and cook for about 3 to 4 minutes or until soft and the consistency of rice. Refrigerate until ready to use. Make the sauces. In a medium bowl, combine the yogurt, cucumber, red onion, dill, olive oil, garlic, lemon zest and juice, and a dash of salt. In a food processor, add the parsley, garlic, capers, anchovy paste, lemon juice, and a dash of salt and pepper. Pulse until chopped then stream in the olive oil, with the processor running, until smooth. Both sauces can be refrigerated until ready to use. Build the bowl by spooning the quinoa, barley, and cauliflower rice into a 4 serving bowls next to each other. Top with both sauces and the feta, olives, and lemon wedges if using. Healthy and easy doesn't always mean "not as good." These 5 dishes are quick, easy, and beyond loaded with flavor. And they're not SO healthy that they're not Thanksgiving worthy. They also make fabulous dishes for easy weekday meals. Can Thanksgiving be healthy without having to give up your favorites? It can definitely be HEALTHIER! This roasted cream corn is a great example, and it only takes about 5 minutes to make. Maple replaces sugar, lower fat products replace the cream and butter. The best part, it tastes as good as the full-fat version! In a large sauté pan, heat 1 tablespoon of the butter over medium low heat. Add the corn, maple syrup, cream, salt, and pepper and stir together. Bring to a slight boil for one minute and lower the heat. In a small bowl, mix together the remaining tablespoon of butter with the flour until it becomes a thick paste and add to the corn. Cook for about 2 minutes until thick. If it gets too thick, add a little more cream until desired consistency. Transfer to a bowl. Top with Parmesan and parsley. Thanksgiving is upon us, and I can't think of anything more suitable than squash to serve with your turkey and ham for the big day! It's the perfect side dish without being uber-Thanksgiving traditional. Plus, it's a little healthy and you'd never know it! Heat oven to 450 degrees. Peel the butternut squash. Cut off the rough ends then cut in half lengthwise and scoop out the seeds with a spoon. Cut each half into two shorter halves then cut into 1 inch sticks and moons. Cut the ends off the acorn squash then cut in half lengthwise and scoop the seeds out with a spoon. Slice into 1 inch moons - keep the skin on these! Place all the squash on a large sheet pan lined with foil. Drizzle olive oil evenly over the squash then sprinkle with plenty of salt and pepper. Drizzle the maple syrup and sprinkle the cinnamon and red pepper flake. Toss together with your hands until all squash is covered in the oil and spices. Roast in the oven for 15 to 20 minutes or until the squash is slightly soft and caramelized. 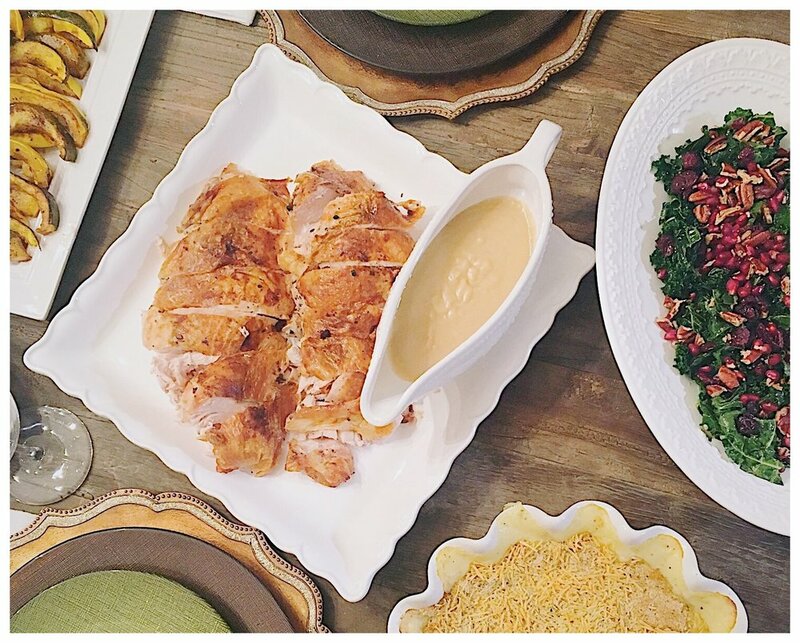 Thanksgiving is typically a day where calories don't count, but it never hurts to have a few healthier dishes at your table. I'll be honest, when I eat this cauliflower mash, I don't even miss mashed potatoes. The brown butter and sage give it such a warm fall flavor, and the (fat free) cream cheese gives it such a fluffy, creamy texture. 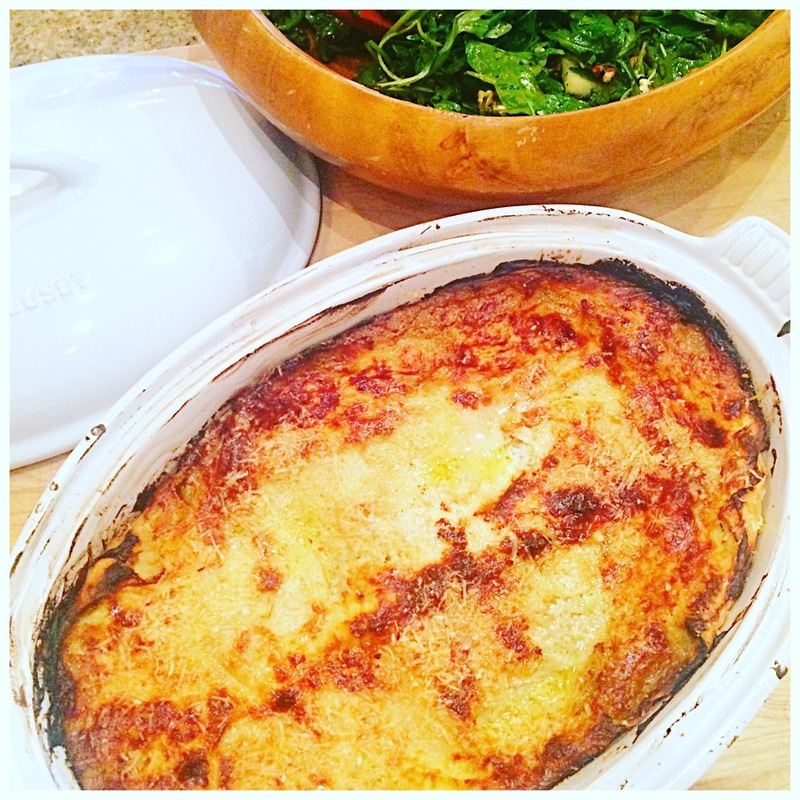 I love this cozy side dish - it'll be at my table all season. Heat butter in a sauté pan over medium heat and don't move. Let the butter melt. When it starts to brown around the edges, add the chopped and whole leaf sage. Remove the whole leaves with a slotted spoon to a folded paper towel as soon as they get crispy - about 30 seconds. As soon as the butter is brown and nutty, turn off the heat. This butter can be used immediately or stored in your fridge for several weeks. Steam the cauliflower in a steam basket on your stovetop until very soft. Transfer to a higher speed blender with the garlic, cream cheese, salt, pepper, and 3/4 of the sage butter. Blend until completely smooth. Taste and add more salt if needed. When ready to serve, transfer to a bowl and top with the remaining brown butter and whole sage leaves. Weekly dinner table or Thanksgiving side, this salad is everything I love about fall and NEEDS to be on your table asap. Smoked Gouda, sweet potato, and smoked almonds... need I say more?! So many unique flavors going on here from sweet and salty to creamy and smoky - complete with a hint of that cinnamon holiday flavor we all love so much. I can't put into words enough how great this is - I've had few salads I like more - I guess that sums it up? In a glass jar or plastic container with a lid, add the maple syrup, olive oil, Dijon, cinnamon, and a dash of salt and pepper. Shake together until combined. Heat oven to 400 degrees. On a baking sheet covered in foil, toss together the sweet potato cubes with the olive oil, maple syrup, cinnamon, kosher salt, and pepper. Roast for 12 to 15 minutes or until slightly golden and tender. Set aside to cool. In a salad bowl, mix together the spinach and arugula. Top with the cooked sweet potatoes, smoked almonds, and smoked gouda. Pour the dressing over the top and toss together. It's always necessary to splurge on any holiday, but in July, it's swimsuit season! We have a beach vacay coming up, so I'm doing everything I can to keep it together. Something about my healthy eating habits have resulted in me waking up every morning completely starving, and while I'm typically not a sweets person, I've been craving something sweet lately to go with my morning coffee. 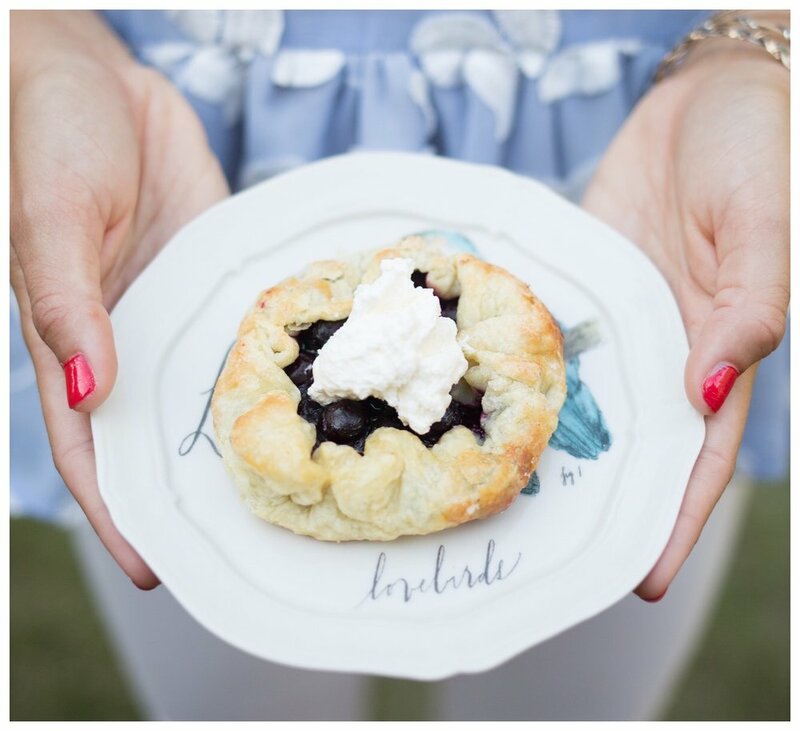 These are the perfect healthy breakfast or even dessert to have on Independence Day! As a matter of fact, I've made them every week for the past month! Heat oven to 375 degrees. Spray an 8-cup mini loaf pan or a 12-cup muffin tin well. 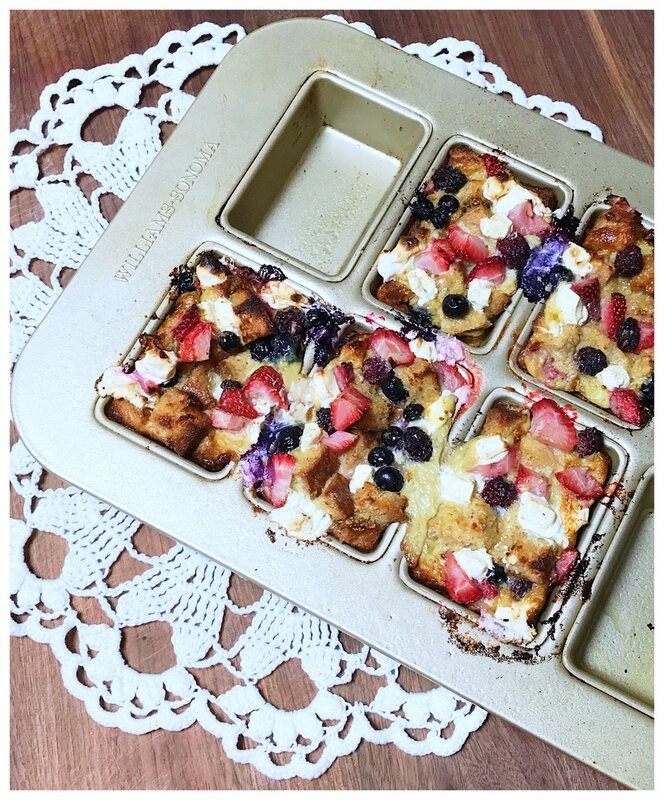 Evenly distribute the bread pieces, strawberries, blueberries, and cubes cream cheese in each tin. In a medium bowl, whisk together the eggs, milk, maple, vanilla, cinnamon, and salt. Pour evenly into each loaf or muffin cup. Bake for 15 to 25 minutes or until golden and cooked through. Time will vary depending on tin used - watch closely. Serve warm or room temperature with a drizzle of maple syrup or fat-free whipped cream. Peaches are my go-to this time of year. If I'm at a farmer's market, I'm getting a whole lotta them. Since my Peach Buratta Salad from the cookbook, this is the best Peach Salad I've ever made!! 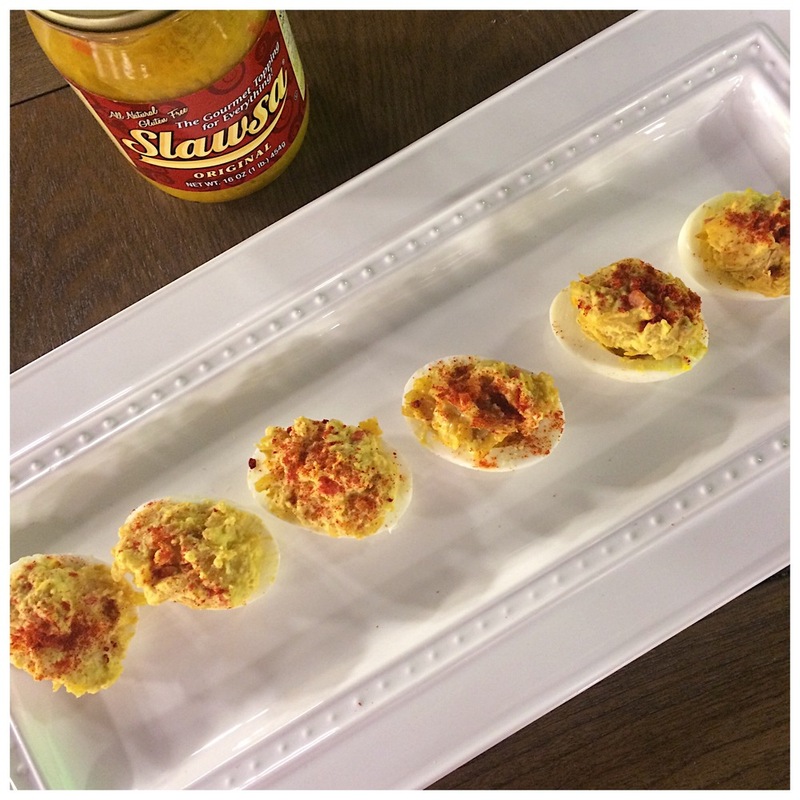 Y'all, this is mind-blowing good and should be your new weeknight favorite! Place peach and onion slices into a large bowl. In a saucepan, bring water, vinegar, sugar, maple syrup, salt, cinnamon, and pepper flakes to a boil. Take off the heat and let cool slightly for about 10 minutes. Pour over the peach-onion mixture and let sit for about 30 minutes. Drain and set the pickled peaches and onions aside, retaining 2 tablespoons of the liquid in the same large bowl. Add the lemon juice, honey, a dash of salt and pepper, and whisk in the olive oil until combined. Add the spinach arugula mixture and toss together until coated. Plate in a large salad bowl to share or on four separate plates with the cranberry goat cheese, smoked almonds, and crystallized ginger over the top. Quick and easy for the perfect last course of any meal. These can be prepped ahead and refrigerated then popped in the oven right before the dessert course! Using a rolling pin, roll out the 2 sheets of puff pastry on a lightly floured surface until large enough to cut out 4 to 5 inch circles. Using a 4 or 5 inch round bowl, trace circles with a knife and cut out. Place circles on a baking sheet lined with parchment paper. Fill each center with some of the blueberry mixture and rustically fold ends over fairly tight. Brush with egg wash and sprinkle with remaining sugar. Bake for about 12 to 15 minutes or until golden. Serve with whipped cream. One of my favorite meals mama used to make was good ole fashioned lasagna. This one is a little bit different than the traditional - using white sauce, truffle butter, and lots of mushrooms. You can lighten this dish up by using skim milk, less cheese, and more mushrooms - either way, it's absolutely delightful! Heat oven to 400 degrees. Place noodles in an 8 x 12 baking dish and cover with the hottest tap water you can get from your sink. Soak for 25 to 30 minutes until soft then drain and set aside. If wavy part of noodle still seems too crunchy, add more hot tap water for about 5 more minutes - drain and set aside. Dry baking dish. Heat olive oil over medium heat and add half of the mushrooms with a dash of salt and pepper. Cook until just soft then add the rest of the mushrooms with a dash of salt and pepper. Cook until just soft. Take off the heat and let slightly cool. Add the ricotta, half the mozzarella, and half the Parmesan. Mix together and set aside. In another pan, heat truffle butter until melted. Whisk in the flour and cook for about 2 minutes. Slowly add the milk, whisking everything together. Let come to a slight boil and thicken - it should be thick enough to coat the back of a spoon. Add the nutmeg, about 1/2 teaspoon of kosher salt, and 1/4 teaspoon pepper - taste for seasoning. Add more if needed. Build the lasagna. Spoon a thin layer of the sauce in the bottom of the pan. Layer half the noodles, half the sauce, and the mushroom mixture. Repeat for the top layer with the rest of the noodles, the rest of the sauce, and the rest of the mushroom mixture. Sprinkle with the remaining mozzarella and Parmesan. Bake for about 20 to 25 minutes or until golden and bubbly. Serve with a drizzle of truffle oil, if desired. I love simple, healthy, low-cal, grab and go breakfasts in the morning. These sandwiches can be pre-made, refrigerated, and reheated in the morning. This recipe makes 4, so you'll have one Monday through Thursday. However, they take right under 10 minutes to make, so if you want them fresh, it won't ruin your morning. Cut English muffins in half. Using your hands, scoop out and discard some of the bread on the inside (this is not compeletely necessary but will save you calories and carbs). Toast the muffins in a toaster until golden. Heat olive oil in a sauté pan over low heat, and swirl around until the bottom of the pan is covered in the oil and glistening. Add the egg whites and sprinkle the spinach over top with a dash of salt and pepper. Scramble eggs, pressing down flat, so when they're done cooking they all stick together. Turn off the heat and using a spatula, cut eggs into 4 equal servings. Place eggs on the English muffins, folding over to fit the sandwich, if needed. Top with the avocado and sriracha or hot sauce. I used to think I didn't like olives. I say "used to think" because I never gave them a chance. That's the thing about a picky eater... They seem to think they don't like lots of things - until they try them. I know this because I used to be one. Luckily, or maybe unluckily, (I haven't decided which one yet after a wee-thicker waist-line) I don't have that problem anymore. We were in Paris a few years ago, and any time you have drinks in Paris, they always seem to put a bowl of olives on the table. At first, I passed them up. But one afternoon I was starving and started eating them. Soon enough, the bowl was empty, and I was asking for more. That's when I fell in love with olives and now I'm addicted to all shapes, colors, and sizes. This salad is a perfect mix of two lovely ingredients with a few subtle hints of flavor that merry the two together perfectly. Plus, it's super low-calorie and healthy! 1. Heat the olive oil, garlic, oregano, and thyme over low heat. When it starts to slightly bubble, take it off and let steep. 2. In a large bowl, mix together all the tomatoes and olives with the pepperoncini, lemon zest, and salt. 3. When the olive oil is slightly cooled, pour it over the tomato mixture and toss together until well combined. Add the cheese if desired. *** This is the perfect side dish for fish. Use the extra olive oil-liquid mixture as a sauce for the fish! See full video with step by step instructions! 1. In a small bowl, combine the lemon juice, white balsamic, honey, coriander, red pepper flake, and a dash of salt and pepper . Whisk in the olive oil until imulsifed. Set aside. 2. Slice the grapefruit, oranges, and blood oranges into 1/4 inch rounds. For each round, cut the peel off, removing the skin and the pith. Lightly sprinkle slices with salt and pepper. 3. In a large bowl, add the spinach and arugula and toss together with 3/4 of the salad dressing, making sure all of the leaves are covered in dressing. Spread the spinach and arugula mix on a large platter. Top with the citrus rounds, layering the different colors. Add the sliced red onion and pour the remaining dressing over the top. I made homemade ricotta for the first time for a dinner party because I wanted ricotta crostini but didn't want store-bought. I had just got back from Italy where homemade ricotta was abundant, and it was there, I fell in love with the cheese. So I thought, why not make it myself? I was shocked to learn how easy it was and now I make it like crazy for quick, impressive crostini when we have people over. My favorite way to use it is in my Homemade Ricotta Ravioli with Brown Butter Sage sauce recipe. To die for! See the the video on making homemade ricotta! 1. Make the ricotta. In a large Dutch oven or cast iron pot add the milk, cream, salt and stir together over medium heat. Let it come to a complete boil, stirring occasionally, for about 5 minutes. 2. Turn off the heat and stir in the vinegar. Let the mixture sit for several minutes (I wait at least 6-7 minutes) until it curdles. There will be large chunks throughout the mixture. Set a large sieve covered with a damp cheese cloth over a deep bowl. Pour the milk mixture into the sieve, and let the liquid drip out into the bowl. 3. Occasionally discarding the liquid in the bottom of the bowl, let the mixture sit at room temperature for about 30 minutes or until it’s the consistency you desire. The longer it sits, the thicker it gets. When it’s to your liking, pour into bowl drizzle with about a tbsp. of olive oil and mix together. * Refrigerate until ready to use. It will last up to 5 days. This year Tres and I took a trip to Italy with our friends Ginger and James. While we were there, we went truffle hunting, and a sweet little dog, Nebia, found us 5 truffles! We took them back and the wife of the truffle hunter taught us how to make authentic Italian Gnocchi, and we used the truffles to shave right over the dish... Omg it was amazing! Honestly, it was one of the most authentic experiences we have ever had in another country, and I brought the recipe back with me! 1. Preheat oven to 400 degrees. Poke small holes all over the potatoes with a fork and place them on a baking sheet, lightly covered with Kosher salt. Bake for 45 minutes to 1 hour or until slightly overdone. Let cool then cut in half longways. If you have a ricer, you can push the potatoes through the ricer. If not, using a cheese grater, grate the potato on the smallest grating side until the entire potato, aside from the skin, has been pushed through the grater. Discard the skin or any rough part of the potato. The texture of the grated potato should be fluffy. 2. 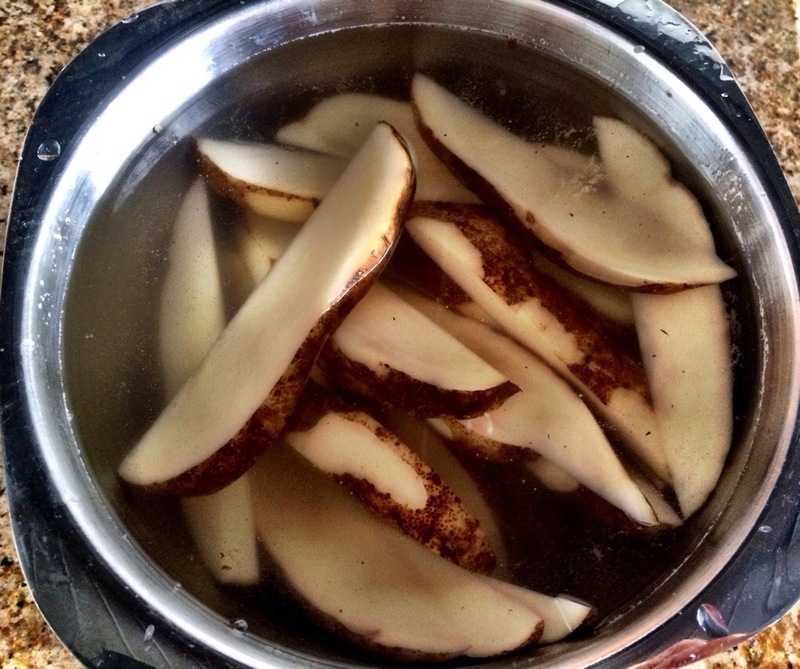 Pour the egg mixture over the grated potatoes, and sprinkle with the salt and pepper. Cover the potato mixture with about ¾ cup of the flour and start to combine lightly with your hands (the key to fluffy gnocchi is lightly handling the dough and not overworking it). Once combined and as the dough becomes sticky or sticks to the board, add more flour. Continue to add more flour as you lightly mix it together. You will know when it’s finished when it holds together and is not too dry or not too sticky. 3. Cut the dough into 4 even pieces and roll each of the 4 pieces into a ½ inch rope, lightly flouring the pieces as needed. Cut the dough into ½ inch piece gnocchi, flouring the dough as you cut them and keeping the gnocchi on a floured baking sheet or work surface. 4. When ready to cook, bring a large pot of water to a boil and add salt. 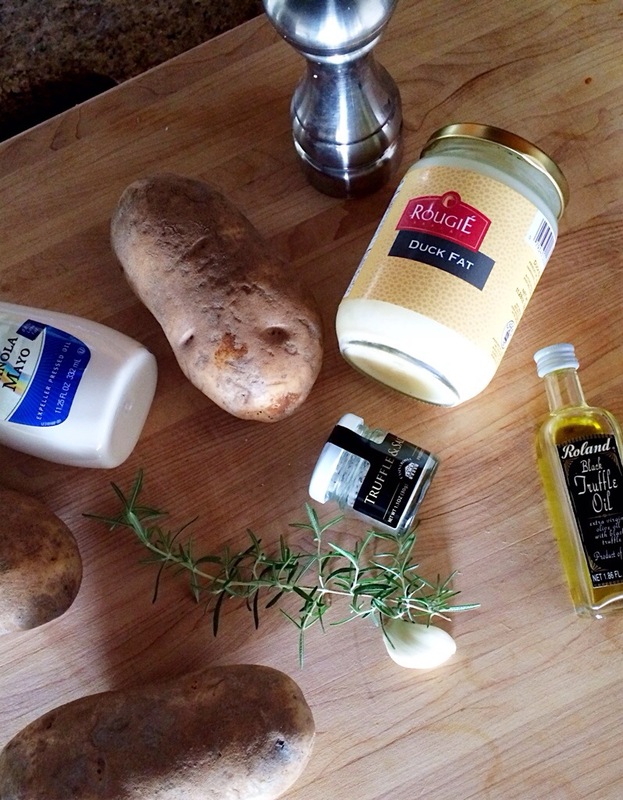 Begin to prepare the truffle sauce by heating a sauté pan over medium heat. Add the butter and let melt. Add the cream and salt, and let come to a slight boil. Simmer the sauce until it thickens. For thicker sauce, whisk in the corn starch. Add the grated parmesan and grated fresh truffles if using them. 5. Boil the gnocchi for about 2 minutes or until they float to the top of the pot. Using a pasta strainer, add them directly into the cream sauce and stir to combine. Add more parmesan to the top and fresh sliced truffles or truffle oil if desired. Something about a little chill in the air makes me want to eat comfort food like its going out of style. Soups, casseroles, hearty meats and veggies - I have been making it all. Traditional lasagna was always a Thanksgiving staple for my family every year, so I thought why not throw a whole lot of fall into it with a butternut squash sauce?! There's nothing more comforting than the combo! 1. Heat oven to 425. On a large baking sheet, toss butternut squash pieces with 2 tbsp of the olive oil and a generous amount of salt and pepper. Roast for 30 minutes or until soft. While the squash is roasting, heat the other tbsp of olive oil in a large saute pan over medium-low heat. Add the onion and a dash of salt and pepper and cook until caramelized - about 15 minutes. Add the garlic, sage, all spice, and red pepper and cook for one more minute. Transfer the mixture to a blender, along with the cooked squash, maple syrup, and half and half. Blend until smooth. 2. In a medium bowl, mix together the ricotta cheese, goat cheese, nutmeg, and a dash of salt and pepper until smooth. 3. Turn oven temperature down to 400. Butter the bottom and sides of a large casserole dish. Ladle a layer of the butternut squash sauce into the bottom of the dish, covering the bottom. Layer noodles, butternut squash sauce, ricotta mixture, and Parmesan cheese in that order. Repeat three times. Finally, top with about 1/2 cup of the remaining Parmesan cheese. Drizzle olive oil over the cheese. Bake for 30-35 minutes or until golden and bubbly. 1. Pile the cake flour and all-purpose flour onto a clean work surface. Sprinkle salt over the top and make a hole in the center of the flour mixture with your hands. Add the eggs and olive oil to the center and beat together with a fork. 2. Slowly, begin incorporating the flour from the sides into the egg mixture. Add a tbsp of water at a time, continuing to mix with the fork until the dough starts to come together. It will take approximately 1/4 to 1/3 cup of water to come together. 3. When dough roughly comes together, begin kneading with your hands for 8 to 10 minutes. Add more flour if it's too wet, more water if it's too dry. The dough consistency will be smooth and elastic when it's ready. 4. Cut into four pieces. Working with one piece at a time, flatten the dough out and run through a pasta machine about five times or until thin, about 1/8 inch. Cut each thinned piece in half, the shape of traditional lasagna noodles or to fit the casserole dish you are using. For this recipe, you'll have one of the four pieces of pasta dough leftover. Save and make another pasta dish. 1. Mash together yolks in a bowl first, then throughly mix in Slawsa & mayo. 2. Spoon generously into egg whites and garnish with paprika and/or parsley. Tip: For perfectly cooked and easy peel-able hard-boiled eggs, put 12 eggs in a saucepan. Cover 1 inch over eggs with water. Add 2 tsp of baking soda to water. Turn heat to high and bring eggs to a rolling boil for one minute, the cover, remove from the heat and let sit for 12 minutes. Remove eggs and place in ice bath to quickly cool before using. In addition to the baking soda trick, using older eggs also will make them easier to peel. When I was in high school, I had a serious addiction to boneless hot wings... I ordered them everywhere I went! Today, I have a serious addiction to hummus. When I'm trying to eat healthy, I like to keep it around as a snack. I thought why not put the two together and create the best of both worlds?! This stuff is seriously good! 1. Make the Tahini paste. In a small pan over medium low heat, toast the sesame seeds until light brown. Put seeds in a food processor and add olive oil, blending until it comes together into a runny paste. It will make about 1/4 cup of paste. 2. To the food processor, add the paste, beans, bean liquid, lemon juice, garlic, vinegar, salt, and hot sauce. Blend all the ingredients together until smooth. If it's not smooth enough, add more liquid from the beans and lemon juice until it's to your desired consistency. 3. Taste for seasoning and add more salt if needed. Pour in a bowl and top with the cheese and a drizzle of the hot sauce. Serve with celery, carrots, cucumbers, or pita bread. 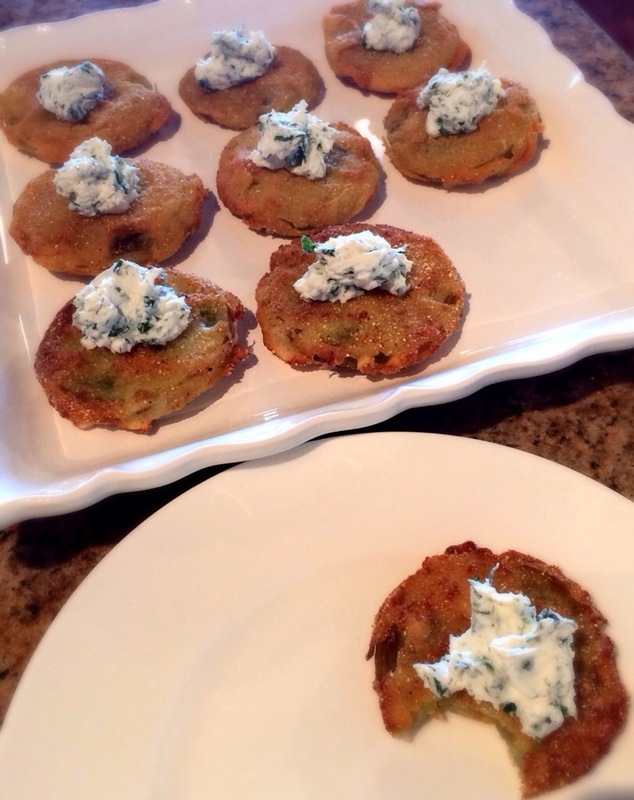 A few several Saturdays ago, me and a couple of my "steel magnolias" made a batch of "fried green tomatoes." It was a long Saturday of being in the kitchen, drinking cocktails, laughing, telling stories, and just enjoying each other's company - a rare thing for us these days. I'll never forget going into college thinking I'd never find friends as strong and fantastic as the ones from high school. My mom assured me that in every stage of my life I would make new friends and they would be "just as fabulous" as the ones before. I have to say though, my college group of gals is and will always be "my most fabulous friends." They are my best friends, as time goes on, I realize more than ever that it's going to take more than being in different cities, busy work and family lives, and finding less and less time to get together to break the close bond we created in college and have sustained as adults. It's crazy to think I've known these girls for over 10 years now, and near or far, we do the best we can to get together at least a few times a year (the constant 24/7 group text we've had going for several years now doesn't hurt either). These southern gals are my magnolias, and this fried green tomato recipe is dedicated to y'all... I hope we make them together for another 50 years! Heat peanut oil to 350 degrees in a fryer or on your stovetop. Make the herb goat cheese. 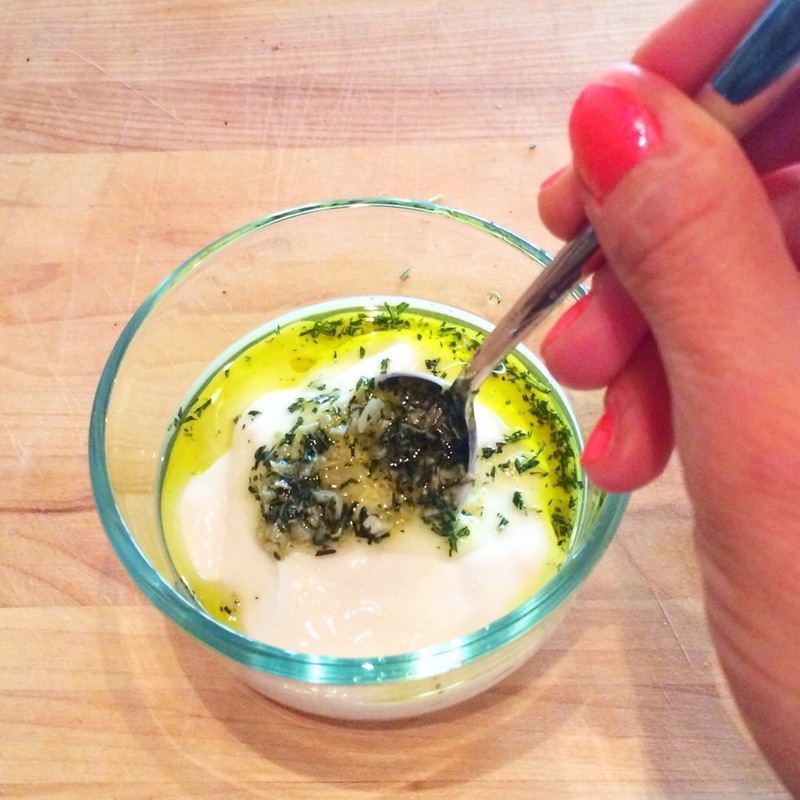 Mix together goat cheese, lemon juice, herbs, and a dash of salt and pepper. Set aside. Whisk 1 cup flour and 1 cup buttermilk together in a bowl. In another more shallow bowl, mix together the cornmeal, garlic powder, cayenne, and paprika. Slice tomatoes 1/4 inches thick. Dry the tomatoes with paper towels. Salt and pepper them on both sides. Dip tomatoes in buttermilk mixture and then coat them in the cornmeal mixture. Step 4 Fry coated tomatoes until golden brown. Plate the fried tomatoes and dollop with goat cheese. Serve warm or at room temperature. CHEERS TO HAPPY EATING!!! AND BEST GIRLFRIENDS!! !